The term ‘recession proof’ gets tossed around quite a bit in the business world. I often hear such and such company or such and such market is recession proof. I have even heard it said that the military market is recession proof. The fact of the matter is that no market or no company is recession proof. When the economy slows down it affects us all. However, it is true that not every businesses and market is affected the same way. Some businesses and markets are more inelastic in economic terms, which simply means they don’t respond as sharply to economic swings. Take for instance gas, if the price goes up or down, people keep on buying the stuff. Demand may slow if the price doubles, but overall, relative to the price changes, gas continues to be purchased at a high rate. Just like a product can be inelastic, markets can be inelastic, and the military market is one of those. Unlike large corporations, the payroll of the Department of Defense and the military is not necessarily correlated to the state of the economy. While big companies are downsizing, US troops continue to work and fight around the world, collecting paychecks, and many times sending them back home to spouses to spend locally in the US. Whether or not you agree with US foreign policy, the fact remains that the Department of Defense employs one of the largest workforces in the world, spending around $95 billion a year on its payroll. While the rest of the economy is shrinking there is good reason to focus marketing efforts on the military. So take a look at your marketing and positioning to see if you could benefit from making the military a bigger part of your business. You will be rewarded with a steady and loyal clientele, that can help your business smooth out the roller coaster economy we seem to have become a part of. Are you using all the resources of MilitaryAvenue? One of our goals at MilitaryAvenue.com is to connect the military community with your "outside the gates" business. With that in mind we have multiple ways for you to reach the military community and I want to ensure you are using them all! We have many opportunities for businesses around large military population centers to list ads in multiple locations. We allow three free ads within 100 miles of your office. Are there multiple installations nearby? Have you placed an ad at three of them? Duplicating an ad is easy! Go to Business Partner Log In, log in with your username and password and then go to the Current Listings section. Find the red Copy to New Listing link and it will copy your listing and all you have to do is choose the new installation/base and then go to checkout and submit! Five minutes total including finding your password! Does your business fit more than one category? You can duplicate the ad and change the category like we suggested above for the multiple installations! One note: Please ensure the business profile and MilitaryReward match the category. Have you become an Expert in our Answers area? We have a new section on MilitaryAvenue where you can assist military members and their families by answering their questions about your area, business or just general information. Go to Military Answers and sign up as an expert and see how you can help military families get information by answering their questions. Would like to send us an article to post in your area of expertise? We have articles on the site that are frequently referred to by our readers for information on How To ... We would love to include yours! If writing is your strength please forward your article to our newsletter editor, leanne@militaryavenue.com. Importantly, make sure the article is general information (as opposed to an article that is more of an advertisement for your business) for our readers; and you have permission to publish it. We will provide proper credit and reference your business and ad in the article when placed on the site. Thank you for your support to the troops and their families! Click here to view coupon featured at Luke Air Force Base. A special thank you to Water Safe Kids and all of our MAPP partners for supporting your military community with your Rewards. The holidays are upon us ... and there are US military members and families spread throughout the US and the world. My family of five will be separated this year as my husband serves our US Army in the Iraqi Theatre. This Christmas will not be the same as those in the past. But I realize it isn't just my family. The nature of the military requires countless moves across the country and separation from loved ones. From the adults who miss their moms, dads, siblings, nieces & nephews to the children who over the holidays. It isn't always feasible for cash-strapped newlyweds stationed in California to get home to Virginia in December. An 18 year-old soldier might not get leave approved to travel from Texas to Idaho and won't be home for the first time this Christmas. A spouse stationed in Maryland, with a husband in Iraq wouldn't think of travelling with her three-children back to her old stomping grounds in New Mexico, even though it means she won't be with her own family as everyone gathers for a New Years celebration. You get the picture? There are all kinds of situations; all kinds of loved ones missing their family in December. Reach out to the community this December. Adopt a service-member, and their family if they have one. Host a celebration. Let the military-community know that you care for them. 40% of our service-members are single. It is possible they will be spending Christmas in their dorm. Can you invite a group over for dinner with a small token-present to give? 42% of our service-members have a family and may be financially burdened to provide for them. Do you know of a local Santa Clause that can help them out? 16% are married but with no children. This Christmas they might really be missing the hustle and bustle of their childhood home. Consider hosting a relaxed couples-night out for your military community; or present gift cards for a night out for two to dinner. One of the reasons MilitaryAvenue.com was created was to help our military families navigate the new-community around them as they search for new businesses to invest in and find companies they are comfortable with. There is a sea of information out there and it can be quite frustrating to look for an area business only to meet dead-ends: invalid email addresses, disconnected phones, business-fronts with a 'For Lease' sign in the window. As a Military Partner, please, insure that you keep your account up to date. If your email address changes, please log-in and keep it up to date! MilitaryAvenue.com never sells or leases your information. However, if we try several times to contact you and hit our own dead-end we will set your ad to 'Incomplete'. There is no reason to keep our very important military-community searching blindly for area businesses. Let us give them the tools and the information they need to make the right decisions while they navigate the information highway for businesses in their neighborhood! November is Military Family Appreciation Month! We are already five days into the month and it is certainly a busy month! However, we would be remiss in not noting this month aimed at supporting the families of our service personnel! Let's take the time to recognize their dedication to our great nation and say a big thank you! How about changing your MilitaryReward to add an opening line, "Thank you to our Military Families during November"!? We know they would appreciate the gesture and your market appeal and reach will be expanded as well. You will be seen as a business that is aware of military issues and that will bring folks through your front door. Your ad and Reward can be edited at any time! New Rewards get picked up and seen more frequently in Our Newest Partners rotating highlights! Just go to the green Business Partner Log In and proceed to the Current Listings section. Click on the red edit button and make your changes/updates including your new comment on the MilitaryReward! Then go to checkout and submit your update. If you know a military family is visiting your business say a simple thank you and you will get a repeat customer and friend too! On this election day I had to write about voting and the military community. Why? I think it helps define the military culture and how you can target your marketing to them. The military lifestyle can make it hard to get to the polls! New states, new polling locations, no notice deployments/TDYs and other issues can make it hard to find a way to be a successful voter! Finding information on local issues from long distance is also tough. Sometimes states make it hard during overseas assignments by requiring applications for absentee ballots in a short timeframe so you can't get the ballot in time for filing it. Some have made changes to that process after military personnel were short changed of this opportunity in the past. Pride in voting is one part of the military culture but what makes a military member and their family (if they are married and 60% are) tick? Why do they go to such effort to vote? Military families take pride in their work, most enjoy the military lifestyle and they realize how important the duties of a citizen are because they are frequently personally affected by this process. In fact, I would say that they are probably the group of citizens most affected by the vote outcome at the federal level. Decisions on military budgets, social programs, medical programs and military pay issues are controlled in DC by congress and the President. Recently these programs have been very favorable as they should have been during a time of war. Military families are seeing long separations but also more pay and benefits too! Combat zones create tax exclusion advantages, dislocation allowances, combat pay and other benefits. In addition, the federal government and the individual services' efforts to support spouse employment are increasing. The military family now has more resources, a steady income and discretionary spending has improved significantly. So as a Military Avenue Partner you have opportunities to target your marketing with this group of patriotic citizens. Show you are a military friendly business with posters, signs, stickers, special discounts and they will respond! Remember that pride I mentioned earlier in their work and culture? Show your pride in them too! They will respond. November is here! There is a chill in the air, the leaves have changed into a menagerie of colors and the first word that comes to mind for me is "Traditions". Our November military-family newsletter will be published November 24th just in time for Thanksgiving. What are your favorite Holiday Traditions? What are some traditions that are local to your area that might be new for an area military-family? What are some traditions that have been passed down from generation to generation? Send them our way and we will compile into a great resource for all of our Military Families. If we use your tradition we will include your name, business name and your local military-installation in our article. Do you have a simple tradition to share? Please do tell! We would love articles from our MilitaryAvenue.com partners and our Military Members (that includes the family). Send any submissions to: leanne@militaryavenue.com, or leave as a comment on our blog. There is no doubt about it now, the economy is slowing down and people and businesses are starting to feel it. During downturns, it is easy to focus on the negatives as it can feel like more work to earn the same amount. However, a period of contraction can serve as a healthy process that can cleanse and streamline your business. For those willing to distance themselves from the media and the “sky is falling” mentality, there is much opportunity for the enterprising individual. The following are some questions to help stimulate thought to create positive change in your business, so when thing inevitably turn around, your business will be leaner and meaner than ever. . When was the last time I took a close look at my expenses? If I doubled the budget in any given category, how would it affect business? If I halved the budget in any given category, how would it affect business? What areas or systems require the most resources of the business? What areas or systems could be reorganized more efficiently? Who could you partner with or pool resources with to create efficiencies? What am I spending on marketing and advertising? How accountable are my marketing dollars for performance? Are there marketing dollars that are underperforming that I should cut off? Are there marketing dollars that are outperforming that deserve more resources? What are some ways that I can promote the business cheaply and/or free? How can I use this time to my advantage to grow the business? Are there people looking for work who could bring something of tremendous value to the business? These are just a few questions to get the ball rolling. Many times its only when the right question is asked that the proper solution appears. Feel free to post more ideas in the comments section. We often only find what we look for. Stay positive and seek the opportunity. May your business thrive. We are always seeking to push new ideas online for our Partners. One of our most recent is a new format that brings your MilitaryReward right to the front of your ad. It becomes your signpost and beacon that you are a military friendly business and tells the piece of your story that you want told! So please keep those Rewards up to date and with the right message! How about a Veterans' Day recognition of some sort? Many veterans and especially families appreciate a business that takes the time to actually recognize veterans instead of just taking advantage of a sale for the day! November's Featured MilitaryReward is from Texas! "Other Than Roses Photography" is based out of San Antonio. Their Reward featured offers for weddings and deployments and is aimed directly at their military audience's needs! This is one of the most critical criteria we use for selection! Thank you for your wonderful offer! *Active Duty Military Discount's available! - Getting Married? - Want Family Photos? Show your AD ID card and receive 20% any package/session price and 25% off any prints ordered! - Deploying? - Check out Operation Love Reunited at OpLove.org on how you can get a free photo session and a free photo album shipped to you at your deployed location. You can see the "Other Than Roses Photography" Ad at Lackland AFB Photographers! Do you see any Rewards that you think should be nominated? Please forward to us through Feedback and we will include them in next month's competition! When someone mentions a Veteran what comes to mind? Your World War II Grandfather? The homeless Vietnam Veteran? An aging group of service-members tucked away in a government nursing home? In fact, more than 25% of today's military-Veterans are under 50 years old and almost half are under 60. They are a loyal, growing population in your neighborhood. Make them a viable part of your business-plan. Be sure to thank them with your words and actions this coming Veterans' Day and throughout the year! Staying ahead of the game is always a challenge in a fast moving world. In the information overload in which we sometimes find ourselves, we can miss critical information that is just there for the taking! MilitaryAvenue.com is the street between your business and the military marketplace! In order to keep the path wide open we always need new and fresh ideas that appeal to both the military community and our Partners! We have a blog for military families, Our Letters to You, but realized that we were missing an opportunity to keep the Avenue wide open with you, our Partners, with a business oriented blog. Why, "Your Military Community: How to..." as a title for this new blog? We want this blog to meet your needs and assist your marketing, your ad appeal, your outreach, your assistance to military families, tell your success stories to other businesses and basically: How to meet our partner needs while they assist military family members and personnel with their services and products. In the future we intend to write from our personal experiences; include some demographic information; explain how to target the military audience; update you on changes on MilitaryAvenue that help us grow and increase your ad visits which strengthens your sales and services. We will share links to articles on the site and would like to have input from our Partners as well! If you would like to write or comment we would be sure to include your business information as well. We ask that you not use the blog as just an advertising opportunity but more of an educational effort and open forum. Tell us and the other partners "How to..." and we will share your information so we can all make MilitaryAvenue a better place and your business can be a military friendly face in the crowd for your military personnel and their families! The Military Reward reads: 10% off nightly rates for any size condo at The Inn. Two night minimum stay required. Advance reservations required. Please mention coupon at time of booking. Click here to view coupon featured at Panama City Naval Support Activity. A special thanks to The Inn at St Thomas Square and all our MAPP partners for supporting the military with your Military Rewards. 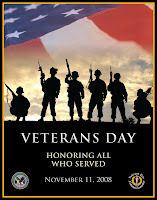 Next month is Veteran's Day and a great chance for you to note their sacrifices and protection of our great country. I decided to write early about it so you, our MilitaryAvenue Partners have time to prepare for this day of recognition for those who have frequently given so much for their country. Are you familiar with their issues and day to day lives? Many military families are operating with a second or third deployment over the holidays! Can you say "again"? They sure could use a simple "thank you" from all of us. How about these ideas to jump start your recognition of Veteran's Day and making it something that makes veterans and their families feel appreciated? How about a "Veterans, Thank You" sign on your door! 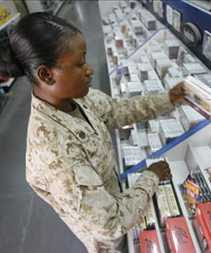 Have your sales staff made aware of military customers and task the staff to thank them for their service-ie. "We Thank Veterans"
DOW down 400 points, DOW up 500 points, DOW down 777 points. If you have watched TV or read any newspapers lately, it's hard to escape the talk of the turmoil in the financial markets. While these events are significant and deserve a certain degree of our respect and attention, they can also be distracting. While they can be distracting, crises can also represent tremendous opportunity. When everyone else is losing their heads you can gain ground. Each of us has a circle of influence. At the center of the circle are things we have the greatest influence over and at the outer edges are the areas we have the least control over. The mistake that many make during times of crisis is to focus their attention on the things they have the least control over. This diffuses their thoughts and energies from areas of productivity. When their attention leaves areas of productivity, their situation worsens and then they have more "evidence" for how bad things are. This causes them more stress, feeding even more into the crisis mind set. This can turn into a nasty negative feedback loop that becomes self fulfilling. The ones who stay level headed and focus on the areas they can influence most, inevitably come out on the top of the pile no matter how things end up. Which person do you want to be? Every situation no matter how "bad" has an opportunity. Look for it, recognize it, and seize it! So focus on the things you can control and forget everything else. Let others worry about the details you have no control over and dominate your area of influence. Go and profit. Blessings.